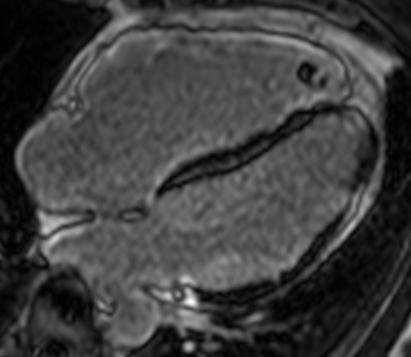 Arrhythmogenic Right Ventricular Dysplasia/Cardiomyopathy or RVOT Tachycardia? A 27-year-old Caucasian nurse was admitted with a 1-week history of dizziness, palpitation and syncope. Her past medical history was unremarkable and she was on no regular medication. She was a lifelong non-smoker and drank minimal alcohol. There was no family history of sudden cardiac death. 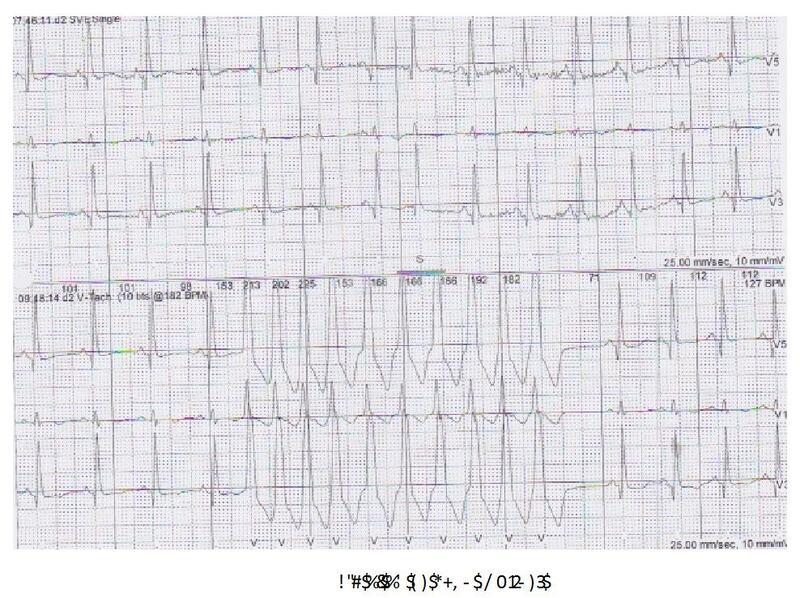 On examination she was in sinus rhythm at 80/min with frequent premature ventricular contractions (PVCs). She was haemodynamically stable. The cardiovascular and chest examinations were unremarkable. 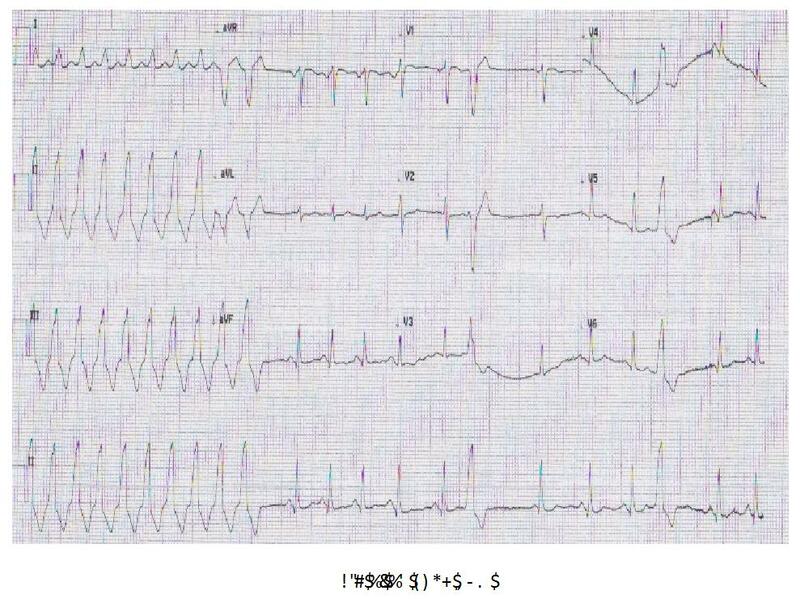 Her 12 lead ECG showed sinus rhythm, T wave inversion in V1-V4 and frequent PVCs or short runs of non sustained ventricular tachycardia (VT) with left bundle branch block (LBBB) morphology and inferior axis as shown in figure 1. Her 24 hr tape showed normal sinus rhythm with >3000 PVCs over 24hr and few runs of non-sustained VT as in figure 2. Her blood tests including cardiac markers and chest X-ray were within normal limits. Transthoracic echocardiography revealed a normal left ventricle with preserved systolic function. The right ventricle was reported as ?dyskinetic due to poor echo windows. The main differentials were Idiopathic VT (RVOT tachycardia) or Arrhythmogenic Right Ventricular Cardiomyopathy (ARVC). 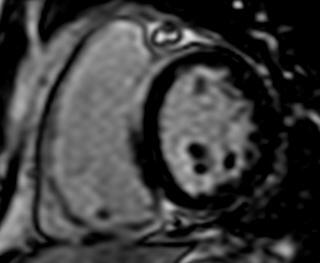 She underwent a cardiac MRI, which showed preserved LV systolic function. The RV function was mildly impaired with dyskinetic free wall (fig 3) and patchy late gadolinium enhancements (LGE) in anterior and inferior RV insertion points (fig 4). Based on evidence of 1 major and 3 minor criteria, the diagnosis of ARVC was made. She was treated with Bisoprolol and subsequently underwent ICD implantation. ARV Dysplasia/Cardiomyopathy is a form of primary cardiomyopathy (genetic) characterized by fibrofatty replacement of the right ventricular (RV) myocardium. 2 Clinical presentations can be varied hence; a high index of suspicion is required for timely diagnosis, especially in young patients who present with arrhythmias, syncope or cardiac arrest. 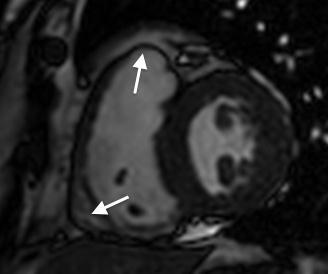 This case illustrates the adjunctive role of Cardiac MRI in patients presenting with broad complex tachycardia and inconclusive echocardiogram. Once the diagnosis of ARVC has been confirmed, an early assessment for the need for implantable defibrillator therapy needs to be carried out. 2. McKenna WJ, Thiene G, Nava A, et al. Diagnosis of arrhythmogenic right ventricular dysplasia/cardiomyopathy. Task Force of the Working Group Myocardial and Pericardial Disease of the European Society of Cardiology and of the Scientific Council on Cardiomyopathies of the International Society and Federation of Cardiology. Br Heart J 1994;71:21518. 3. Basso C, Corrado D, Marcus FI, et al. Arrhythmogenic right ventricular cardiomyopathy. Lancet 2009;373:1289 1300. 6. Corrado D, Calkins H, Link MS, et al. Prophylactic implantable defibrillator in patients with arrhythmogenic right ventricular cardiomyopathy/dysplasia and no prior ventricular fibrillation or sustained ventricular tachycardia. Circulation 2010; 21;122(12):1144-52. 7. Bhonsale A, James CA, Tichnell C, et al. Incidence and predictors of implantable cardioverter-defibrillator therapy in patients with arrhythmogenic right ventricular dysplasia/cardiomyopathy undergoing implantable cardioverter-defibrillator implantation for primary prevention. J Am Coll Cardiol 2011;58(14):1485-96. Thanks for the case. It was succinct and had very nice illustrations.